Rabbit bells, photographed in Miliitary Trail Natural Area, Deerfiled Beach, Broward County, in May 2014. Strange name. Cool little flower. Rabbit bells, Crotalaria rotundifolia, is a Florida native found in pinelands and other "upland" habitats. 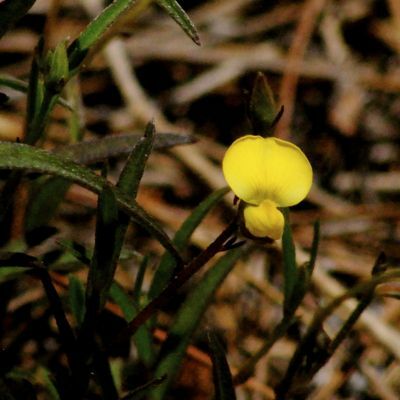 It is one of two members of the Crotalaria genus that are native to the Sunshine State, and found in all but two of the 67counties, both in the Panhandle. Rabbit bells grows along the Atlantic Coast states as far north as Maryland and along the Gulf Coast to Louisiana. Its native range extends into Arkansas, which has labeled the plant (and all Crotalaria species) as a noxious weed. Maryland has classified rabbit bells as endangered. It's found in parts of the Caribbean, Mexico and Central America. Despite the scarcity in Maryland, rabbit bells is globally secure as a species. It is a ground hugger, maxing out at about six inches tall. Rabbit bells can be upright or trailing along the ground. The leaves are simple and somewhat rounded in shape, although they can vary quite a bit. They are arranged alternately along the stem. Rabbit bells produces bright yellow flowers about a half-inch long that, in turn, produce fat, pea-like seed pods that are characteristic of Crotalaria. Shake the pod and the seeds rattle. It is a host plant for the ceraunus blue butterfly and rattlebox moth, aka bella moth, which uses other members of Crotalaria as well. 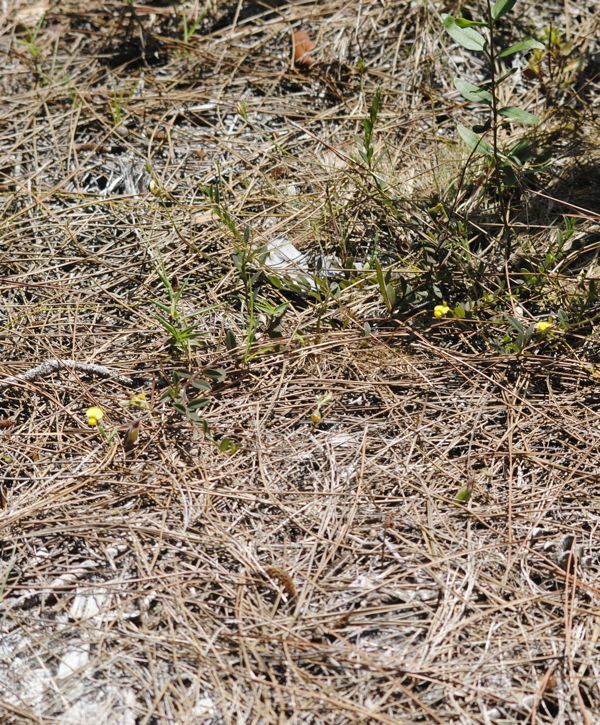 The rattlebox is one of the few showy moths in Florida and depends on chemicals that the Crotalaria species produce for their bright colors, which also happens to be its defense system. One interesting note about rabbit bells and the rattlebox moth. The larvae of the moth will penetrate the pods of crotalaria species and eat the seeds. It's probably the reason why the numerous exotic crotalaria have yet to become the invasive pests many fear. The moths keep the plants in check. Rabbit bells and other native crotalaria have evolved to produce harder pods that resemble peanut shells that are more difficult for the moths to penetrate. And if they do get inside, the seeds are more watery, less nutritious and have less of the toxins the moths desire than the exotics. Seminoles made treatment for sore throat from the seed pods. It is cultivated, used in natural landscapes, wildflower and butterfly gardens. Rabbit bells has something like nine alternative scientific names, or synonyms. That many names is usually the result of variations in the plant's form that causes botantists to think they're seeing something different from what they expected. Other common names and spellings: prostrate rattlebox, rabbitbells and rabbit-bells. Rabbit bells is a member of Fabaceae, the pea family.